Make a hearty vegetarian vegetable soup out of ingredients you probably already have in your pantry. This soup is so easy to make you'll be wondering why you don't make your own all the time. Throw in whatever you have that you think will taste good in a soup. 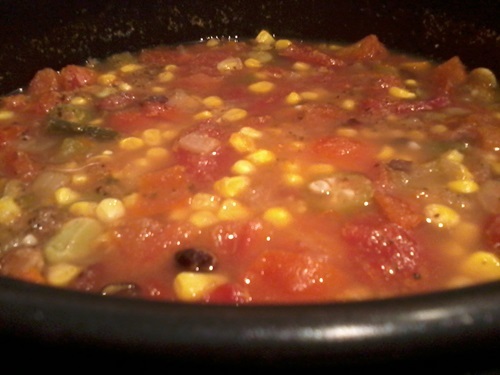 Beans, potatoes, tomatoes, celery... canned or frozen veggies of any kind will work, as will your favorite fresh ones. 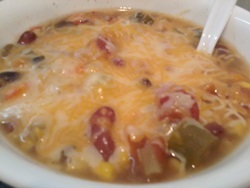 This one was concocted from a bunch of canned and frozen vegetables I had on hand. The only thing I bought specifically for making soup was a bag of frozen soup ready veggies. Everything else was in the pantry. Open your canned beans and potatoes. Empty all three into a strainer. Rinse them under cool water and drain. Throw them into the bottom of the pot or slow cooker. 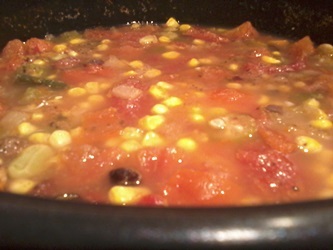 Throw in your entire bag of soup vegetables into the pot and stir until well blended with the beans and potatoes. Add the entire can of stewed tomatoes, your seasonings, and enough vegetable broth to just cover the contents of the pot. Bring to a boil, cover and simmer for about 45 minutes. Remove the lid, stir and... very carefully... taste test the soup. It will be steaming hot so please be very careful. If you think it needs a little something, toss in a little more garlic and onion powder, stir it well, then put the lid back on and leave it alone for another 15 to 30 minutes. Check it at 15 and if the vegetables aren't quite as tender as you like them, leave it on another 15 minutes. I cook mine for about an hour and 20 minutes for good measure and it is wonderful.